If your desire is to own a quality, totally renovated home across from the beach in the very desirable Paekakariki beach settlement, then here is your opportunity. This home has been transformed with extensions designed by AD Architecture to an exacting level and is a truly magnificent place to call home. Enjoy the breathtaking views from the floor to ceiling windows looking out to sea and watch the ever changing seasons from the comfort of your lounge. Or step out onto the perfectly positioned front deck, an ideal setting for entertaining or just relaxing and watching the sunset, there are lots of options. There is also a very sheltered and sunny back courtyard with an easy care garden, all fully fenced keeping young ones or pets safe. Besides the garaging there is ample off street parking with room for the boat, camper, kayaks, paddle and surf boards. This home has some truly unique features from the chapel style ceilings to a "secret gallery loft" above part of the family lounge. A beautiful solid gourmet kitchen in the heart of the entertaining space, 4 heat pumps, double glazed, spacious bedrooms - some with sliders out to the private garden, quality tiled bathrooms and just so much storage. 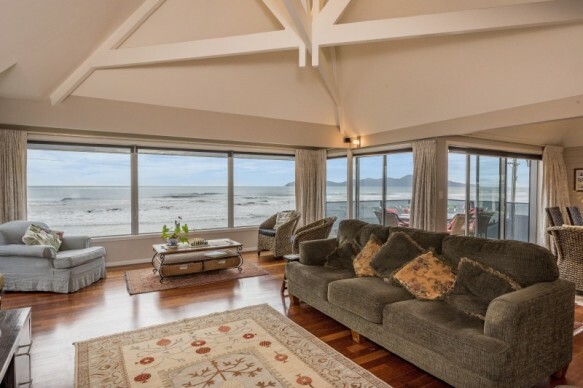 Seldom do such quality beach properties become available in Paekakariki so don't miss out and book your viewing today. Ring Ceinwen 0800 684 663. RV $1,130,000.